You are currently browsing the archive for the ARTS AND SCIENCES category. 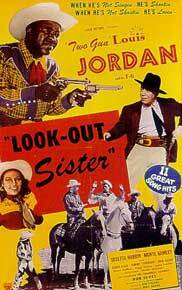 from “Look Out Sister,” 1947 Musical/Western film directed by Louis Jordan & Bud Pollard, and written by John E. Gordon and Will Morrissey. ‘Early in the Mornin” was written by Dallas Bartley, Leo Hickman, Louis Jordan, and recorded by Louis Jordan and His Tympany Five in 1947.
b/w ‘Oh My Golly (a song by the Pixies), available on iTunes and their bandcamp.